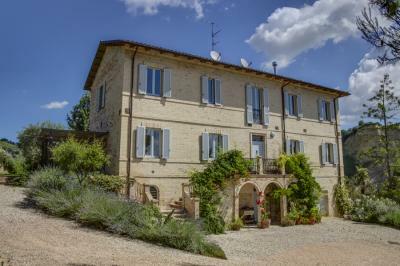 In the countryside of Monteprandone, In a dominant position, surrounded by beautiful landscape, we offer for Sale Villa with pool and guest apartment. The Villa is around 485 sqm and is spread over three floors with a garden of 2400 sqm. extremely detailed with numerous trees. The property is completely fenced and equipped with a double driveway. From the main entrance, located on the ground floor leads to the living area consisting of large living room and kitchen and both face onto a porch with sitting rooms, south facing. On the same floor there is a sitting area-relax where you can reach the double bedroom with en suite bathroom and toilet. Through internal staircase leads to the upper floor consists of two bedrooms and a bathroom, one of the double bedrooms has walk in closet and balcony. The lower ground floor, with access from the sitting room and the garage, is characterized by a large rustico with fireplace, a kitchen and a bathroom with laundry facilities. In the Villa there is also a guest apartment with separate entrance on the ground floor, living room/kitchen, bedroom and bathroom as well as balconies and terraces, a spiral staircase leads to the basement. The Villa is situated on a beautiful hill between the Town of Monteprandone and City of San Benedetto del Tronto. Only 4 km from the beach!! 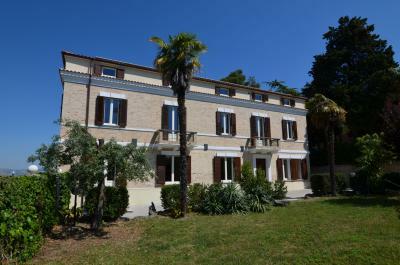 This property enjoys spectacular views overlooking the Sea and Sibillini mountains.